$100 Supercomputer – so close I can taste it! 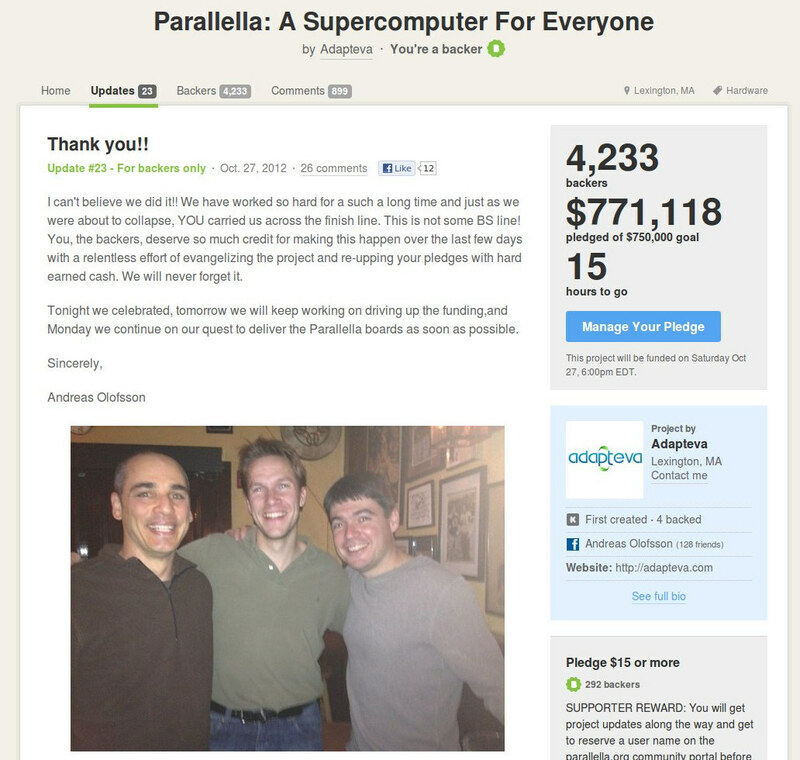 Wow – things are really racing along with regard to the Parallella Supercomputer project on Kickstarter. When I posted my first blog on this topic on Tuesday of this week, the project had raised only $439,565 of their $750,000 goal. I just visited the project on Kickstarter – now they are up to $611,504, which means that $171,939 has been pledged in just three days!!! But we still need to raise $138,496 for this Kickstarter project to go forward. The deadline is Saturday, Oct. 27, at 6:00 p.m. EDT, so there are only about 30 hours to go at the time of this writing. Why do I care? Well, several reasons, actually, not the least that I've made the $99 pledge myself, for which amount I shall receive my very own Parallella Supercomputer … but ONLY if the Kickstarter project reaches its goal. But the main reason is that I really like Andreas and the folks at Adapteva – I remember a couple of years ago when Andreas left his job, disappeared down into his basement, and – fed (occasionally) on sandwiches prepared by his long-suffering wife -- single-handedly invented a new computer architecture, designed his own System-on-Chip (SoC) from the ground up – including learning how to use all of the EDA tools – then took the device all the way to working silicon and a packaged prototype (click here to see that epic tale). The $100 Parallella Supercomputer is the next chapter in the story – the combination of Adapteva's Epiphany multicore processor chip and Xilinx's Zynq All Programmable SoC with its dual-core ARM Cortex-A9 processor and traditional FPGA programmable fabric. Block diagram of the Zynq-based Parallella personal supercomputer. Oooooh, the things I will be able to do with this little beauty … BUT ONLY IF THE KICKSTARTER PROJECT REACHES ITS GOAL!!! 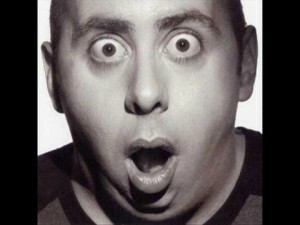 (Sorry … I didn’t mean to shout). So please help me spread the word – start pinging everyone you know on Facebook, LinkedIn, Twitter, and so forth. This is a chance to make a difference – let's not blow this opportunity for the sake of only $138,496. If you found this article to be of interest, visit Programmable Logic Designline where – in addition to my Max's Cool Beans blogs – you will find the latest and greatest design, technology, product, and news articles with regard to programmable logic devices of every flavor and size (FPGAs, CPLDs, CSSPs, PSoCs...). Also, you can obtain a highlights update delivered directly to your inbox by signing up for my weekly newsletter – just Click Here to request this newsletter using the Manage Newsletters tab (if you aren't already a member you'll be asked to register, but it's free and painless so don't let that stop you [grin]). Once completed, the 64-core version of the Parallella computer would deliver over 90 GFLOPS of performance and would have the the horse power comparable to a theoretical 45 GHz CPU [64 CPU cores * 700MHz] on a board the size of a credit card while consuming only 5 Watts under typical work loads. For certain applications, this would provide raw performance than a high end server costing thousands of dollars and consuming 400W. IMHO US$ 750,000 is a quite high bar for a kickstarter project. If you check the "most funded" ones, you will see how the very max is in the 250,000÷350,000 range. Isn't this a GPU-like stuff? That can only be used with special instructions and frameworks? Then it wouldn't really be running magically all applications like a 45Ghz CPU nor even a normal desktop, except for the ARM cpu used as base. "On the basis of his research, Andreas determined that the "best-of-the-best" existing solutions were achieving around 0.5 to 1.0 gigaflops per watt (Gfpw). Based on this, Andreas set his target as 50 Gfpw – that's real flops achievable in real-world applications (not marketing flops) – which would be 50 to 100X better than the competition." "Once we have a strong community in place, work will being on PCIe boards containing multiple 1024-core chips with 2048 GFLOPS of double precision performance per chip. At that point, there should be no question that the Parallella would qualify as a true supercomputing platform." I was hooked from your initial post Mikorist. But on further reading, things started to look not as rosy. My main quibble, there is no way to put ones money on a 64 core board or two. Depending on the reaching of the far goal, i would either get 2 64 core boards or 4 16 core boards. What should i do with 4 16 core boards? I havn't even use for 1! They seem to meet the goal. While reading the kickstarter site, they got 8000 dollars pledged. Bringing them to 708000 Dollar. You and i, have different priorities. You value a great price to computing power ratio. I have an application in mind, for which i could use some small ultra high powered, low wattage computers. I really don't care, if they are 200 or 400 Dollars a piece. The 16 core variant would only have the lower wattage as an advantage, That's not enough to rectify all the work it takes to port the software to this new hardware. Congrats. It seemed like it would not get the funding. Seems to be having over funds. Who said they would have trouble to meet their goal? They raised almost 900 thousand dollars, that's almost 150 thousand more than they needed. At the time I first previewed it they need around 200,000 or so. I think Wonko mentioned something about being to high a goal. Actually Wonko meant something different. If you check the "most funded" ones, the intital request tends to be smaller than the initial US$ 750,000 of this project, of course if the idea is good and "popular" enough some people have been largely "over-financed". The good guys at Parallela raised the bar to a rather high level, or if you prefer they did take a big risk (and succeeded ). The sum raised $898,921 divided by the 4,965 backers makes an average of around 180 bucks each. Since we have an "in-house" succesfully founded project , Isostick, that got $66,607 through 419 backers, i.e. an average 160 bucks which is not very different, I find it obvious how it is much easier to find in the same 30 days time-span 420 backers or more than ten times the same. Another kind of mathematical consideration is that through Kickstarter 341 million dollars worth of project were founded since it's birth in April 2009. At 5% "transaction fee" it means that the roughly 40 People in the NY basement got something like a gross 17 million bucks over a 2 and a half years, definitely a successful project in itself, considering the amount of investments needed (next to none) and the risks taken (none at all). Good ideas and taking risks always pays better, than hard work and playing it safe. Much to the annoyance of the stupid and the chicken. Against the two drawbacks there are also a number of advantages, which outweight the drawbacks imo. - Instant market research for free. You know if there's a market for your product, before investing anything. - No need to find buyers after the product is created, because you already have the buyers. - You only need to invest into marketing after you have made some money from the product, not beforehand. Overall, not only your risk at failure drops drasticly with kickstarter, but also how big the failure could be. They took the risk of starting a company. Don't know about Italy, but here in Germany you're usually declared insane by your friends and relatives, when doing something so danagerous, like giving up your job and starting a company, without having a gun held to your head. Naah, here it is much simpler, noone can actually start a company, we have bureaucracy that takes care of preventing it. How long does it take to open a greengrocers shop? Apparently in Germany less than 50 Euros and half an hour, in Italy a couple of months and at least 1000÷1500 Euros. But yes, the few that dare to actually start a company are not only declared insane by friends and relatives, but also by pets, strangers and people casually passing-by .